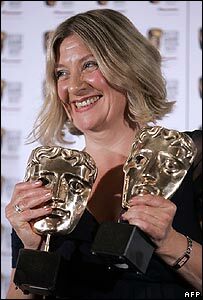 Victoria Wood, Ricky Gervais and The X Factor have been crowned winners of some of the top prizes at this year's Bafta TV Awards in London. Wood's performance in ITV wartime drama Housewife, 49 picked up two awards - best actress and best single drama. She now has a total of seven Baftas - as has Gervais, who beat his Extras co-star Stephen Merchant to the trophy for best comedy performance. And The X Factor won best entertainment programme for the second year in a row. There were some surprises at the ceremony at the London Palladium, including Casualty's victory in the best continuing drama category. The BBC One hospital drama beat soaps Emmerdale, EastEnders and Coronation Street. 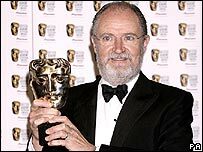 Life on Mars lost out on the drama series award to Jimmy McGovern's powerful The Street, starring Timothy Spall and Jim Broadbent. Broadbent also beat Life on Mars star John Simm to the award for best actor. Broadbent won for his role in Longford, about Lord Longford's campaign to have Moors murderer Myra Hindley released from prison. He triumphed over his co-star Andy Serkis - who played Ian Brady in the film - as well as Michael Sheen, who portrayed the late Kenneth Williams in Fantabulosa! Samantha Morton, who portrayed Hindley in Longford, was up for best actress, as were Anne-Marie Duff for The Virgin Queen and Ruth Wilson for Jane Eyre. But they could not beat Victoria Wood, who adapted and starred in the acclaimed drama about the diaries of a frustrated Cumbrian housewife. Accepting the awards, she said: "I didn't bring any jokes because I wasn't expecting to get either of them." Joan Rivers enlivened proceedings when she let off a tongue-in-cheek tirade at the nominees for best comedy performance as she presented the award. The winner, Ricky Gervais, did not turn up because he is filming in the US - leading Rivers to call his losing co-star Stephen Merchant to accept it on his behalf. "He could have mentioned this before," Merchant said. "Talk about rubbing salt into the wound. "I'm sure he would like me to say I've been robbed, and I would agree. And it's not like he hasn't got enough already." Jonathan Ross was another absentee despite winning best entertainment performance. Friday Night with Jonathan Ross triumphed over Ant & Dec for Saturday Night Takeaway, Stephen Fry for QI and Paul Merton for Have I Got News For You? Elsewhere, Dame Helen Mirren's final Prime Suspect was nominated for best drama serial - but was beaten by another fictionalisation of the Moors murders, ITV's See No Evil. 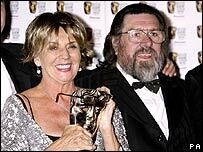 The Royle Family's one-off return was named best situation comedy, beating Green Wing, The IT Crowd and Pulling. The trophy for comedy programme or series went to That Mitchell and Webb Look, which was up against The Catherine Tate Show, Little Britain Abroad and Little Miss Jocelyn. In other categories, Sky One's Ross Kemp on Gangs was named best factual series and BBC Two's The Choir beat The Apprentice, Dragon's Den and The F Word to the features award. Only one award was voted for by the public - the audience award - which provided Life on Mars with its only win of the night. 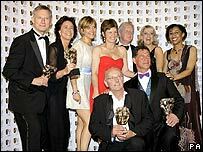 The Vicar of Dibley and Notting Hill writer Richard Curtis received the Academy Fellowship award. How does it feel to win a Bafta?